So you’re smart, but are you reasonable? I was searching for this phantom post pointing to research on verbal reasoning scores and bias (I swear I saw it!) 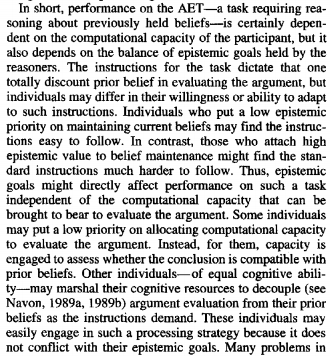 when I came across a fascinating a 1997 paper titled Reasoning Independently of Prior Belief and Individual Differences in Actively Open-Minded Thinking. It’s got some neat if perhaps not totally unsurprising conclusions. First, a quick disclosure: I don’t know this research area at all. If this paper got trashed by all its peers or if its results haven’t held up over time, I wouldn’t know. I’ve looked at the authors’ faculty pages and it looks like they’ve done more recent work that I’ll dig into at some point soon. I’ll skip how they did the experiment and go right to findings. Read for yourself if you’re interested. The first question this raises in my mind is the extent to which this sort of reasoning style is alterable, both in the short and the long terms. To the extent that it is able to change over the long-term, this will have implications both for education and beyond. (Perhaps it’s possible to teach someone to reason outside of priors, and we do so in high school and college, but they lapse over time? Just one potential example of an implication.) In the short-term this interests me because the priming of epistemic goals could be a central feature of better media design aimed at negating bias. I’m looking forward to reading more on this topic. Some blogs revel in eclecticism. Marginal Revolution comes to mind. Despite its broad thematic focus on economics, it embraces a sprawling set of interests, which largely reflects the eclectic genius of its primary writer, Tyler Cowen. In that sense, despite the fact that there are “themes”, MR revolves around an embrace of eclecticism. A key goal of this blog today is to save you time. There is far too much information on climate science, clean energy solutions, and global warming politics for anyone to keep up with. And the status quo media simply puts out too much analysis, most of it quite bad. And yet everyone needs to follow this issue, needs to have an an informed opinion on the most important issue of the decade and the century. Compare that to MR. There is very little efficient about MR. If your goal is to learn economics, you would be well advised to spend your time elsewhere. Even if your goal is to keep up with the economic issues of the day, MR serves up far too many distractions. Romm’s is a “here’s what you need to know” approach. His aim is to “be a one-stop-shop for anyone who wants the inside view on climate science, solutions, and politics” as this brilliant starter post demonstrates. MR would never consider attempting to have the authoratative post on all things economics. It’s a blog about questions, diversions, assortments. Climate Progress is the opposite. It’s the one-stop-shop, the comprehensive guide, the thematic tour. More than that, Romm has a thesis about the reality of climate change, and everything he writes relates to that thesis in some way. His is blogging as dissertation. I’d go so far as to say that MR and Climate Progress would be two of the first blogs I’d assign to anyone looking to “learn about blogging” either from an academic or practitioner’s perspective. Today, we’re excited to announce that we are open sourcing the code forNewsTrust.net, our social news platform. This is highly encouraging behavior from a very innovative organization. I interviewed the head of NewsTrust, Fabrice Florin, on the organization’s new direction for The Atlantic a week or so ago. Likewise, Amy Klein, who graduated from Harvard in 2007 with a degree in English literature, couldn’t find a job in publishing. At one point, she had applied for an editorial-assistant job at Gourmet magazine. Less than two weeks later, Condé Nast shut down that 68- year-old magazine. “So much for that job application,” said Ms. Klein, now 26. One night she bumped into a friend, who asked her to join a punk rock band, Titus Andronicus, as a guitarist. Once, that might have been considered professional suicide. But weighed against a dreary day job, music suddenly held considerable appeal. So last spring, she sublet her room in the Fort Greene section of Brooklyn and toured the country in an old Chevy minivan. Has anyone even collected good statistics on just how many college grads, with nowhere left to turn, have been forced to join Titus Andronicus? Anecdotal reports indicate more young people are joining the band Titus Andronicus than at any point in history. But will Obama propose any remedy? And even if he does, will it even have any impact? This is the state of our political discourse. We’re witnessing the Titus Andronicus-ification of the unemployed, yet we fail to act.